Posted 23rd April 2012 by peterdixon in FixMyTransport team. One of the challenges that FixMyTransport intended to fix was to make it simpler for public transport users to raise complaints. There are a large number of bodies involved in public transport and being a volunteer has been a great opportunity to contact so many different bodies and get them involved. Sometimes, an email response does not provide enough details and to get to the depth of an issue we need to use other tools and bodies to find the answers that FixMyTransport users are looking for. One of those tools is the Freedom of Information Act, which allows members of the public to ask for information about what that public body is doing. MySociety has made this even easier thanks to our sister website WhatDoTheyKnow and several issues have had some really useful developments thanks to this. One of the issues to have moved forward thanks to FixMyTransport using WhatDoTheyKnow has been T Moore’s request for buses stopping outside sheltered accommodation in Heywood, Greater Manchester. The 461 is operated by Rossendale Transport between Heywood and Bury and receives financial support from Transport for Greater Manchester, the local Passenger Transport Executive. Every bus service that receives financial support requires as many passengers as possible to ensure it continues so it frustrated T Moore to see that the bus no longer stopped outside Cherwell Court sheltered accommodation because the Hail and Ride section had been removed but no bus stops had been put in nearby. This issue interested me, so I submitted a Freedom of Information Request to ask Transport for Greater Manchester why the bus service could not stop outside sheltered accommodation, either with a bus stop or a reintroduction of Hail and Ride. One of the frustrations when you campaign to councils about bus stops and shelters is that your issue can appear to be going nowhere because the difference between having a stop or shelter is pretty clear cut. However, the process for putting a bus stop or shelter in requires the involvement of several other bodies including the police, highways engineers and local residents. This can take several months depending on what issues arise. The good news for T Moore is that the stop is being looked at by Transport for Greater Manchester and they have consulted with local residents. Unfortunately, there has been no final decision made yet about this stop installation but this is not far off. Once a final decision is made, the install of bus stops should happen soon after that. However, it is not just the information we get to our questions that are useful but the great additions we get. With this request, we found out a bit more about why Hail and Ride is being phased out. 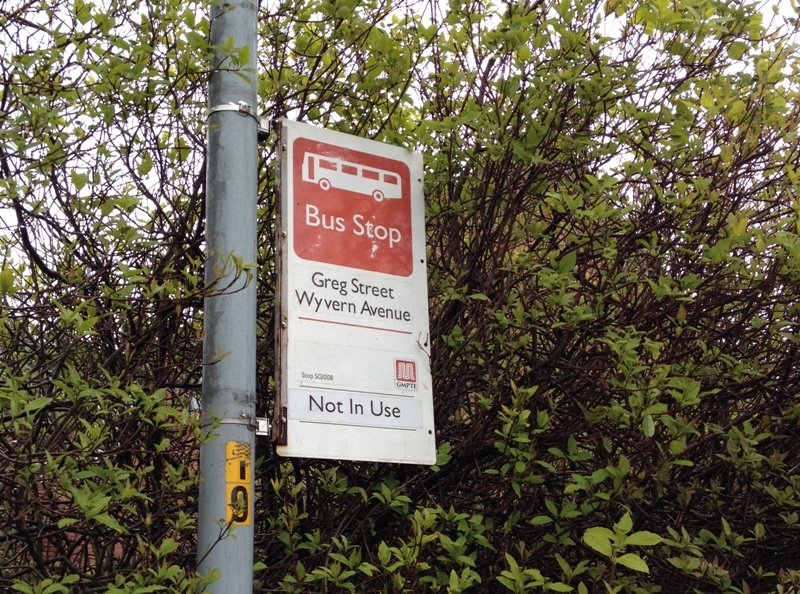 One of the requests for a bus stop on Peel Lane was from the Bus Operator of the 461 Service. The bus operator has asked for all Hail and Ride sections throughout the network they operate to be replaced with formal bus stops as soon as possible. The main issues working against Hail and Ride arrangements is that many operators now provide low floor buses, and only official bus stops with appropriate clearways can ensure that all passengers are able to access such buses. Operators also regularly experience problems on Hail and ride routes in trying to manoeuvre buses up to the kerb for boarding due to parked cars and this can cause problems for boarding to disabled passengers and those with mobility problems. Another consideration working against Hail and Ride is the number of compensation claims being received by operators for injuries sustained whilst passengers board buses in the middle of the road. We have also been advised that Hail and Ride stops can have a negative effect on the reliability of service. FixMyTransport is throwing light over some really interesting areas of public transport and the lessons we are learning now will be really useful for future campaigns. This could be used for your campaigns so if you are looking for a bus stop or bus shelter in your area, FixMyTransport is here for you. One detail from the Wigglybus flexible route service was that the bus would not pick up from the doorstep of a user but from a point that was convenient and safe (it also meant that the user had to be at that point when the bus pulled up – not collecting the purse and coat inside the house. Increasingly it is possible to use SMS and twitter to manage your interface with public transport. kids in Banchory text to agree the boarding time and place to put up to 10 bikes into the hold of the local express coach in to Aberdeen, to use the BMX track – this reduces the potential for delay and co-ordinates the boarding. Cyclists with Caltrain tweet with a Biketrain hashtag to advise on or ask about available space on incoming trains. this could easily be applied to assisted passenger services – potentially eliminating the 24/48 hours notice hiatus (farce), as well as bike space on trains and buses/coaches. Maybe we can find an operator to work with your developers? This is a journal from the volunteers behind FixMyTransport, a free and independent website that helps people report and resolve issues with public transport in the open.